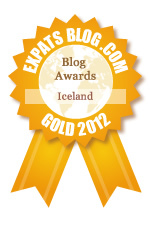 Iceland, as you may have heard, is a pretty egalitarian place. No, things aren’t perfect, but compared to many countries, people are pretty happy and, for the most part, don’t feel like they are somehow more important than other people. As a rule, if you want to interview a famous person, you just call them up on the phone—everyone is pretty much listed in the phone book (with a few exceptions, of course). The prime minister’s office is situated on a very busy, central corner downtown, and, if you want, you can just walk right up to the door, with your horse even. Nevertheless, I can now tell you, dear readers, how name dropping can be done in Icelandic—should the situation arise where you might like to show off about all the super famous people that you know really, really well.